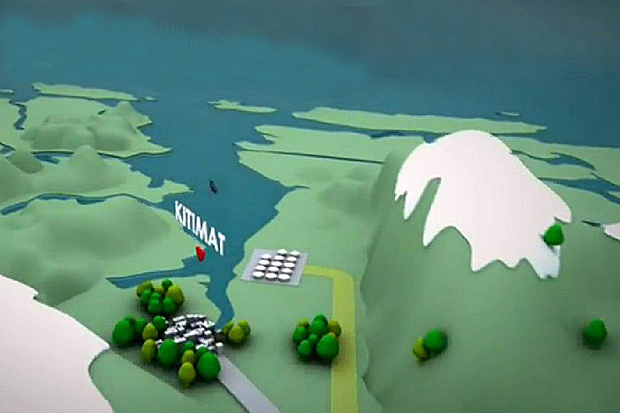 The Ottawa Citizen has a great story today about an advert by Enbridge (the company proposing to build a oil pipeline across British Columbia) that includes a “broadly representational” map that shows prospective supertankers steaming up an unobstructed Douglas Channel channel on their way to and from Kitimat – the proposed terminus of the pipeline. Of course there is a small problem with this map. 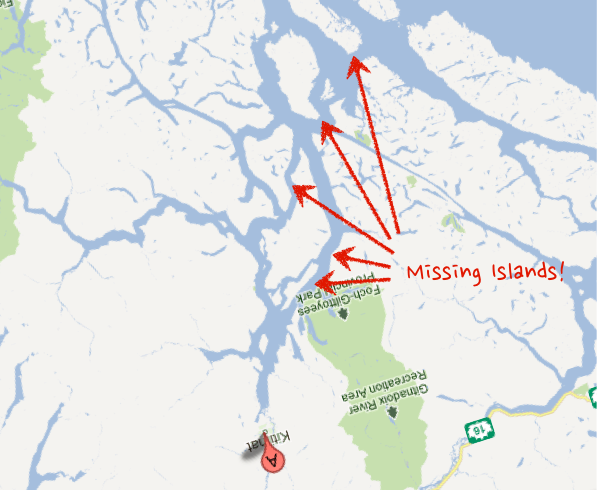 The route to Kitimat by sea looks nothing like this. Take a look at the Google Map view of the same area (I’ve pasted a screen shot below – and rotated the map so you are looking at it from the same “standing” location). Notice something missing from Enbridge’s maps? According to the Ottawa Citizens story an Enbridge spokesperson said their illustration was only meant to be “broadly representational.” Of course, all maps are “representational,” that is what a map is, a representation of reality that purposefully simplifies that reality so as to aid the reader draw conclusions (like how to get from A to B). Of course such a representation can also be used to mislead the reader into drawing the wrong conclusion. 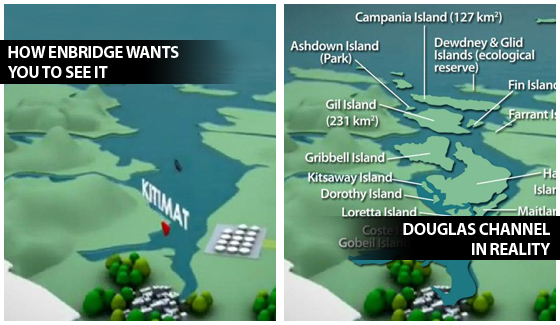 In this case, removing 1000 square kilometers that create a complicated body of water to instead show that oil tankers can steam relatively unimpeded up Douglas Channel from the ocean. Rubbing out some – quite large – islands that make this passage much more complicated of course fits Enbridge’s narrative. The problem is, at this point, given how much the company is suffering from the perception that it is not being fully upfront about its past record and the level of risk to the public, presenting a rosy eyed view of the world is likely to diminish the public’s confidence in Enbridge, not increase their confidence in the project. There is another lesson. This is great example of how facts, data and visualization matter. They do. A lot. And we are, almost every day, being lied to through visual representations from sources we are told to trust. While I know that no one thinks of maps as open or public data in many ways they are. And this is a powerful example of how, when data is open and available, it can enable people to challenge the narratives being presented to them, even when those offering them up are powerful companies backed by a national government. If you are going to create a representation of something you’d better think through what you are trying to present, and how others are going to see it. In Enbridge’s case this was either an effort at guile gone horribly wrong or a communications strategy hopelessly unaware of the context in which it is operating. Whoever you are, and whatever you are visualization – don’t be like Enbridge – think through your data visualization before you unleash it into the wild. This entry was posted in canadian politics, open data, public policy, technology and tagged british columbia, cdnpoli, data, enbridge, maps, visualization on August 15, 2012 by David Eaves. A few weeks ago Colin Hansen – a politician in the governing party in British Columbia (BC) – penned an op-ed in the Vancouver Sun entitled Unlocking our data to save lives. It’s a paper both the current government and opposition should read, as it is filled with some very promising ideas. In it, he notes that BC has one of the best collections of health data anywhere in the world and that, data mining these records could yield patterns – like longitudinal adverse affects when drugs are combined or the correlations between diseases – that could save billions as well as improve health care outcomes. He recommends that the province find ways to share this data with researchers and academics in ways that ensure the privacy of individuals are preserved. While I agree with the idea, one thing we’ve learned in the last 5 years is that, as good as academics are, the wider public is often much better in identifying patterns in large data sets. So I think we should think bolder. Much, much bolder. Of course, the algorithm that Heritage acquires through this contest will be proprietary. They will own it and I can choose who to share it with. But a similar contest run by BC (or say, the VA in the United States) could create a public asset. Why would we care if others made their healthcare system more efficient, as long as we got to as well. We could create a public good, as opposed to Heritage’s private asset. More importantly, we need not offer a prize of $3 million dollars. Several contests with prizes of $10,000 would likely yield a number of exciting results. Thus for very little money with might help revolutionize BC, and possibly Canada’s and even the world’s healthcare systems. It is an exciting opportunity. Of course, the big concern in all of this is privacy. The Globe and Mail featured an article in response to Hansen’s oped (shockingly but unsurprisingly, it failed to link back to – why do newspaper behave that way?) that focused heavily on the privacy concerns but was pretty vague about the details. At no point was a specific concern by the privacy commissioner raised or cited. For example, the article could have talked about the real concern in this space, what is called de-anonymization. This is when an analyst can take records – like health records – that have been anonymized to protect individual’s identity and use alternative sources to figure out who’s records belong to who. In the cases where this occurs it is usually only only a handful of people whose records are identified, but even such limited de-anonymization is unacceptable. You can read more on this here. As far as I can tell, no one has de-anonymized the Heritage Health Prize data. But we can take even more precautions. I recently connected with Rob James – a local epidemiologist who is excited about how opening up anonymized health care records could save lives and money. He shared with me an approach taking by the US census bureau which is even more radical than de-anonymization. As outlined in this (highly technical) research paper by Jennifer C. Huckett and Michael D. Larsen, the approach involves creating a parallel data set that has none of the features of the original but maintains all the relationships between the data points. Since it is the relationships, not the data, that is often important a great deal of research can take place with much lower risks. As Rob points out, there is a reasonably mature academic literature on these types of privacy protecting strategies. The simple fact is, healthcare spending in Canada is on the rise. In many provinces it will eclipse 50% of all spending in the next few years. This path is unsustainable. Spending in the US is even worse. We need to get smarter and more efficient. Data mining is perhaps the most straightforward and accessible strategy at our disposal. So the question is this: does BC want to be a leader in healthcare research and outcomes in an area the whole world is going to be interested in? The foundation – creating a high value data set – is already in place. The unknown is if can we foster a policy infrastructure and public mandate that allows us to think and act in big ways. It would be great if government officials, the privacy commissioner and some civil liberties representatives started to dialogue to find some common ground. The benefits to British Columbians – and potentially to a much wider population – could be enormous, both in money and, more importantly, lives, saved. This entry was posted in canadian politics, open data, public policy, public service sector renewal, technology and tagged bcpoli, bigdata, british columbia, health, healthcare, policy, public policy on May 1, 2012 by David Eaves. For those unfamiliar with Vancouver, it is a city that enjoys a healthy one way rivalry between two university: the University of British Columbia (UBC) and Simon Fraser University (SFU). Growing up here I didn’t think much of Simon Fraser. I don’t mean that in a disparaging way, I mean it literally. SFU was simply never on my radar. UBC I knew. As high school students we would sneak out to its libraries to study for finals and pretend we were mature than we were. But SFU? It was far away. Too remote. Too inaccessible by public transit. Heck, too inaccessible by car(!). And yet today when I think of Vancouver’s two universities UBC is the one that is never on my radar. After noticing that several friends will be on a panel tonight on How Social Media is Changing Politics at UBC’s downtown campus I was reminded of the fact that UBC has a downtown campus. It may be the most underutilized and unloved space in the University. This despite the fact it sits in the heart of Vancouver and under some of the most prime real estate in the city. In fact I don’t think I’ve actually ever been to UBC’s downtown campus. In contrast I can’t count the number of time’s I’ve been to SFU’s downtown campus. And the reason is simple: architecture. It’s not that SFU simple invests in its downtown campus making it part of the university, it’s that it invested in Vancouver by building one of the most remarkable buildings in the city. If you are in Vancouver, go visit The Wosk Centre for Dialogue. It is amazing. Indeed, I feel so strongly about it, I included it in my top ten favourite places when Google Maps added me to their list of Lat/Long experts for the 2010 Winter Olympics. What makes the Wosk Centre so fantastic? It seats 180 or so people in concentric circles, each with their own a mic. It may be the only place where I’ve felt a genuine conversation can take place with such a large group. I’ve seen professors lecture, drug addicts share stories, environmentalists argue among one another and friends debate one another, and it has always been eye opening. Here, in the heart of the city, is a disarming space where stakeholders, experts, citizens or anyone, can be gathered to share ideas and explore their differences in a respectful manner. Moreover, the place just looks beautiful. The building is a testament to how architecture and design can fundamentally alter the relationship between an institution and the city within which it resides. Without the Wosk Centre I’m confident SFU’s downtown presence would have meant much less to me. Moreover, I’m fully willing to agree that UBC is the better university. It ranks better in virtually ever survey, it has global ambitions that even achievable and likely does not want to be involved in the city. That’s a strategic choice I can, on one level, respect. But on a basic level, the Wosk Centre makes SFU relevant to Vancouverites and in doing so, allows the University to punch above its weight, at least locally. And that has real impact, at least for the city’s residents. But I think for the university as well. Reading the always excellent Steven Johnson’s Where Good Ideas Come From I can’t help but think the UBC is missing out on something larger. As Johnson observers, good ideas arise from tensions, from the remixing of other ideas, particularly those from disparate places. They rarely come from the deep thinker isolated out in the woods (UBC lies at the edge of Vancouver beyond a large park) or meditating on a mountain top (SFU’s core campus is atop a small mountain) but out of dense networks where ideas, hunches and thoughts can find one another. Quiet meditation is important. But so to is engagement. Being in the heart of a bustling city is perhaps a distraction, but that may be the point. Those distractions create opportunities, new avenues for exploration and, for universities concerned with raising money from their intellectual capital, to find problems in search of solutions. So raising a structure that is designed to explicitly allow tensions and conflicts to play out… I can’t help but feel that is a real commitment to growth and innovation in a manner that not only gives back to its host community, but positions one to innovate in a manner and pace the 21st century demands. As such, the Wosk Centre, while maybe a shade formal, is a feat of architecture and design, a building that I hope enables a university to rethink itself, but that has definitely become a core part of the social infrastructure of the city and redrawn at least my own relationship with SFU. This entry was posted in commentary, negotiation, vancouver and tagged british columbia, Simon Fraser University, University, vancouver on November 14, 2011 by David Eaves. Earlier this month the Vancouver School Board (VSB) released an iPhone app that – helpfully – will use push notifications to inform parents about school holidays, parent interviews, and scheduling disruptions such as snow days. The app is okay, it’s a little clunky to use, and a lot of the data – such as professional days – while helpful in an app, would be even more helpful as an iCal feed parents could subscribe to in their calendars. That said, the VSB deserves credit for having the vision of developing an app. Positively, the VSB app team hopes to add new features, such as letting parents know about after school activities like concerts, plays and sporting events. This is a great innovation and without a doubt, other school boards will want apps of their own. The problem is, this is very likely to lead to an enormous amount of waste and duplication. The last thing citizens want is for every school board to be spending $15-50K developing iPhone apps. Which leads to a broader opportunity for the Minister of Education. Were I the Education Minister, I’d have my technology team recreate the specs of the VSB app and propose an RFP for it but under an open source license and using phonegap so it would work on both iPhone and Android. In addition, I’d ensure it could offer reminders – like we do at recollect.net – so that people could get email or text messages without a smart phone at all. I would then propose the ministry cover %60 percent of the development and yearly upkeep costs. The other 40% would be covered by the school boards interested in joining the project. Thus, assuming the app had a development cost of $40K and a yearly upkeep of $5K, if only one school board signed up it would have to pay $16K for the app (a pretty good deal) and $2K a year in upkeep. But if 5 school districts signed up, each would only pay $3.2K in development costs and $400 dollars a year in upkeep costs. Better still, the more that sign up, the cheaper it gets for each of them. I’d also propose a governance model in which those who contribute money for develop would have the right to elect a sub-group to oversee the feature roadmap. Since the code would be open source other provinces, school districts and private schools could also use the app (although not participate in the development roadmap), and any improvements they made to the code base would be shared back to the benefit of BC school districts. Of course by signing up to the app project school boards would be committing to ensure their schools shared up to date notifications about the relevant information – probably a best practice that they should be doing anyways. This process work is where the real work lies. However, a simple webform (included in the price) would cover much of the technical side of that problem. Better still the Ministry of Education could offer its infrastructure for hosting and managing any data the school boards wish to collect and share, further reducing costs and, equally important, ensuring the data was standardized across the participating school boards. So why should the Ministry of Education care? First, creating new ways to update parents about important events – like when report cards are issued so that parents know to ask for them – helps improve education outcomes. That should probably reason enough, but there are other reasons as well. Second, it would allow the ministry, and the school boards, to collect some new data: professional day dates, average number of snow days, frequency of emergency disruptions, number of parents in a district interested in these types of notifications. Over time, this data could reveal important information about educational outcomes and be helpful. But the real benefit would be in both cost savings and in enabling less well resourced school districts to benefit from technological innovation wealthier school districts will likely pursue if left to their own devices. Given there are 59 english school districts in BC, if even half of them spent 30K developing their own iPhone apps, then almost $1M dollars would be collectively spent on software development. By spending $24K, the ministry ensures that this $1M dollars instead gets spent on teachers, resources and schools. Equally important, less tech savvy or well equipped school districts would be able to participate and benefit. Of course, if the City of Vancouver school district was smart, they’d open source their app, approach the Ministry of Education and offer it as the basis of such a venture. Doing that wouldn’t just make them head of the class, it’d be helping everyone get smarter, faster. This entry was posted in commentary, open data, open source, public policy, technology and tagged apps, british columbia, education, gov20, innovation, mozilla, open source, technology, vancouver on August 29, 2011 by David Eaves. Canadians spend a lot of time worrying about the “thickening” border with the United States. This is for good reason. Given the importance of the US market and the sheer number of exports between the two countries, issues that thicken the border – like the requirement to use a passport or more strict rules around shipping goods – have an enormous impact on Canada’s economy. Usually, Canadian officials complain that it is hard to get Americans to engage on this issue. So it is exceedingly frustrating when the Canadian government takes actions that thicken the border and simultaneously discouraging and encouraging when it is senior American officials have to intervene to make it thinner. Last week, despite lobbying from the Mayor of Vancouver, the Premier of British Columbia, a number of business and tourism representatives and even conservative party caucus members, the Federal Goverment looked set on killing a program that saw a set of Border Guards pre-clearing trains that run from Vancouver to Seattle. Without this pre-clearance the trains would run much, much slower and so Amtrak, who runs the trains, said it would end the service. It now appears that the border service was saved only after U.S. Homeland Security Secretary Janet Napolitano and U.S. ambassador to Canada David Jacobson personally intervene. Yes, you read that right. US officials were racing trying to persuade Canadian officials to keep the border more open. The problematic nature of such a headline cannot be underscored. Yes, it is great that senior officials in the US care about ensure the Canada-US border remains as open as possible. But, as a country still dependent on an open and friction free border with the Unites States it is disturbing their intervention was necessary. Indeed, as the country with the most to suffer when the border gets thicker (we feel the loss of exports and trade more than the Americans do) we need to model behaviour and be a leader in striving to make it as open and as accessible as possible. Secretary Janet Napolitano and U.S. ambassador to Canada David Jacobson intervention now means that two senior US officials may now believe that Canada’s commitment to friction free and accessible border is not as strong as we have claimed. If we aren’t concerned here, maybe we aren’t as concerned on other, even greater areas of concern regarding the increased thickening of the Canada-US border. And the damage has not been undone. Public Safety Minister Vic Toews, who is responsible for the decision, has only only preserved the service for one year. Indeed, in his statement he added “In this period of time, the residents of British Columbia and Washington State primarily will demonstrate whether, in fact, this is a necessary service.” Of course, the second train has already doubled the number of people traveling via rail between the two cities and, according to BC’s transportation minister, has injected $11.8 million into the BC economy. Canadians should be thrilled that Public Safety Minister Vic Toews and the government ultimately made the right decision around keeping this service in place. But as a country still concerned about the weakened economy, the US border and our relationship with the United States, we should be concerned that the government took the most painful and costly route to arrive at this decision. This entry was posted in canadian foreign policy, commentary and tagged border, british columbia, business, economy on October 15, 2010 by David Eaves.